Fall. It's the most beautiful time of year! As soon as I saw this stamp I KNEW what I wanted to make with it. I have a huge stash of candlesticks- they're perfect for so many craft projects. True, I'd never used one as a stand for a chunky canvas- but... it worked! Using a chunky 8-inch canvas, I slapped a single coat of chalk paint onto it. So far, so good. 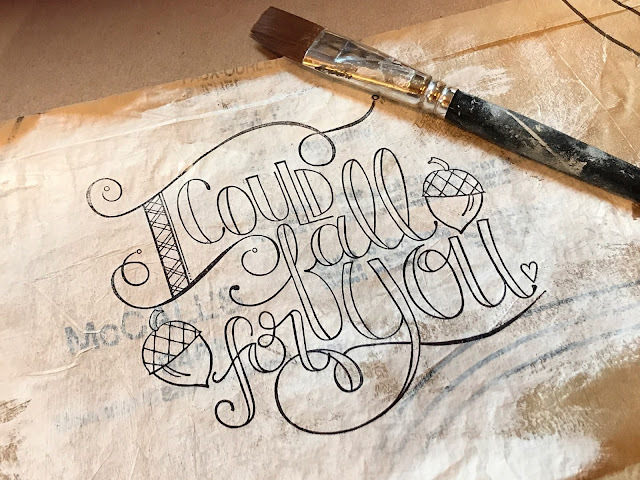 Next I needed to add the cute image from Tammy Tutterow's Fall For You stamp. I have to admit, my first try was unsuccessful. I stamped directly onto the canvas and it was a disaster. My second try wasn't much better- I stamped onto a piece of paper, intending to lay it over the top of the canvas. It was vanilla. Totally dull. Then I decided to stamp it onto a sheet of old pattern tissue. I loved it- and hated it too. The print on the tissue made it difficult to see the stamped image. OK, number three into the trash. Finally I brushed a single coat of gesso over the tissue, let it dry and then stamped over that. It was perfect! Using a leaf die from Tonic Studios, I cranked out a couple dozen from mixed printed papers in all the beautiful shades of Fall that I love so much. It was quick work to arrange them into a wreath around the central stamped image. One last detail- Nuvo Cryatal Drops in brown to give the impression of nailheads around the edge of the canvas. After that, all that was left was to glue the canvas onto the top of the candlestick. I loved the look of the slender candlestick with the heft of the canvas on top- and now I can't wait to make another one... thinking about varying heights of candlesticks and different sizes of canvases... oh, the possibilities! Love your candlestick canvas, Terri, it's so clever! I'm glad to know that I'm not the only one who has to do redos several times. The colors and leaves and their arrangement are so pretty! Wow, this just just stunning!! Swooning here, Terri! I could look at this forever! All the different patterns on the leaves are such a gorgeous frame for Tammy's fun sentiment! Thud! That is me, falling hard for this gorgeous piece of home decor. I. Am. In. Love. Wow, wow, wow! The technique you used for the stamping is brilliant, and I am so going to use it. And seriously, I thought those WERE nailheads around the perimeter of the canvas. They are so perfect. And the candlestick. I'm going to the Goodwill. And I am buying candlesticks. Just pure creative genius here and I love every stinking gorgeous detail. Hugs! This has been falling for all the members of the time. The accountability of the things and essayservices.com legit has been implemented for the use of the true elements or the humans. The science is welcomed for the use the scientific atoms for the people. Getting the projects in university life is very common some projects are very special. As I am art student I made this buy an essay uk I knew that my teachers loved my project because it looks beautiful.